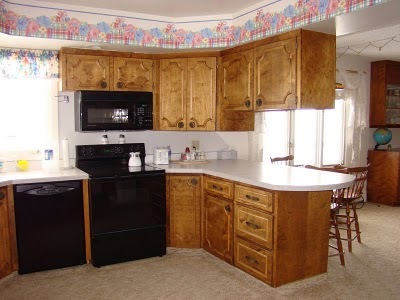 ^ These cabinets and all the other built-ins in the house were custom built by the builder. 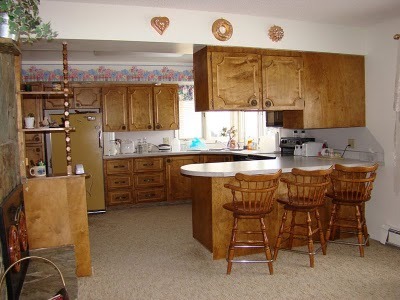 The kitchen isn't entirely original. 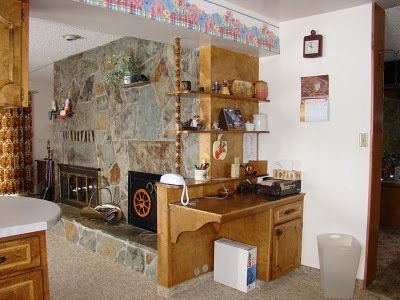 The counter tops were once avocado green, and the stove and dishwasher are updated too. ^ These cabinets and the others throughout the house have very elaborate hardware. 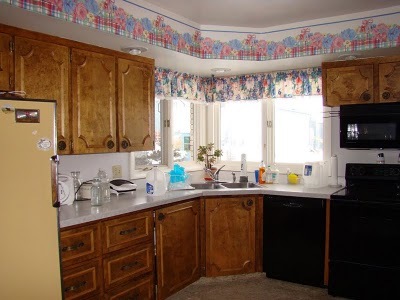 And carpet in the kitchen? It might have worked for my Grandma, but I wouldn't recommend it when you have 3 children. ^ The secretary desk is a handy spot. The fireplace beyond matches the planter in the entry. 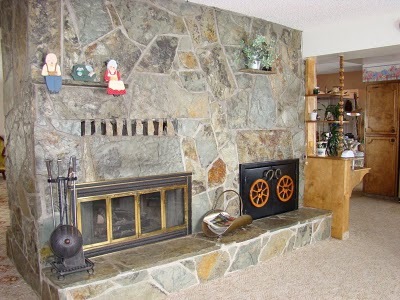 ^ On the far right of the fireplace is a wood box. Can you see the horseshoe handles? Well, as long as I can remember this was carpet-lined and contained toys instead of wood. It is a favorite hideout of the kids. ^ Another view of the kitchen from the dining room. ^ The dining room. Behind the curtains are sliding glass doors that lead out to the deck. 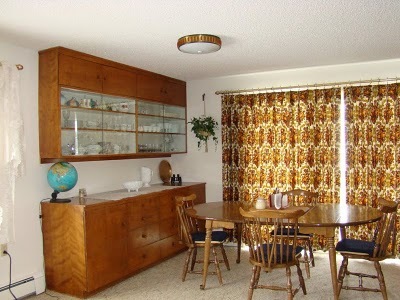 The buffet and china cupboard on the wall were made by my Grandma's dad and were brought over from their old house. Tell me what you think! Next post: the Living Room.